But the U.S. economic growth data seems clear enough. The reason why Buffett and other analysts don’t seem to trust the numbers is not hard to understand. In fact, one of the other key aspects of economic growth is employment. GDP growth does not automatically or promptly translate into a strong labor market performance. After all, if the economy grows without spreading this wealth to as big a section of the Americans as possible, what’s the point? Indeed, the favorable GDP growth rate would have prompted more enthused reactions if jobs growth had been as good. Instead, the U.S. labor market performance was worse than expected. The lower jobs growth stats suggest that the benefits of higher GDP growth are coming to be concentrated in fewer hands. If the Fed should move rates higher next December in the name of controlling inflation, it could spark another recession. Moreover, many employed Americans will not have noticed a pay rise lately. The economists will tell them to blame the lack of inflation. The Fed will tell them that inflation is under control. Who is right? You don’t need a U.S. productivity chart to notice that labor might not be as scarce as the low unemployment rate of 4.4% suggests. Many people are employed in part-time jobs or underemployed. Many more may have stopped searching because there are fewer jobs available now than before the 2008 financial crisis. With so many people looking for jobs—the unemployed and the underemployed—it’s no wonder that wages aren’t going up. In fact, salaries and their relationship to economic growth stopped making sense some 40 years ago. Since the 1980s, spreading the benefits of growth has done more to boost corporate profits than income levels. The higher profits, said the theory, benefit the stock price. In fact, since the 1990s, stock ownership has risen. People who never once had a thought about stocks suddenly became investors. That has increased risk levels. China in the summer of 2015 provided the perfect example of this phenomenon. At the first signs of trouble, many new inexperienced investors started to sell shares of stocks they understood very little about, causing a major crash. Encouraging more people to invest in the stock market may be more beneficial than otherwise in the long run. But there’s another more insidious effect of slower wage growth. As wage growth dropped, to keep consumption the same, many households dug into their savings at first. Then, to sustain growth, the financial gurus invented more financial “products” aimed at getting people into debt. As savings dropped to zero, credit was the trojan horse that allowed for the average Joe to keep up with the Joneses. U.S. households have become ever more indebted to banks. First, there were real estate mortgages. But those help families make an investment. Then, of course, there were car purchases. Even those (despite rapid depreciation the moment the new owner drives off the lot) can be considered an investment. In North America, after all, apart from a handful of major cities, most people need a car to get to work. But, the biggest trojan horse of all has been credit cards. The 2008 financial crisis was supposed to have taught Americans not to rely on credit. But, how strong-willed should Americans be? They are bombarded with advertising and messages encouraging them to buy and get the latest gadgets and clothes. When they go home, there’s no shelter from shopping. With the excuse that prices are better online—and often they are—people have binged on seemingly innocent purchases. “But I saved 50%!” you say. The fact is that you spent 100% of money best left untouched. This raises a major suspicion. Is it possible that factors influencing economic growth have been corrupted by credit card-fueled consumption? U.S. GDP by year has reached levels last seen some 10 years ago. Yet, the world discovered that much of that GDP growth was false. It was ephemeral and based on toxic debt. There’s plenty of concern. Look around. You will see the natural products and consequences of household debt growth. The neighbors’ new car, new clothes, new smartphone, and latest vacation were paid for with debt. In other words, they weren’t paid. People resorted to credit cards to buy homes and cars. This was all supposed to have, if not ended, moderated. Yet the cheap money from low interest rates has pushed stock market indices higher. After dropping like bricks, real estate prices have increased in many areas, inflating bubbles in many cities. But, comparing the visual evidence of increased consumption at every level with the real unemployment rate—masked by elusive calculations—curiosity is piqued. Is it possible that the so-called economic recovery actually reflects another case of untenable debt? After all, given the inability for the economy to produce real wage growth, how on earth has the economy grown? 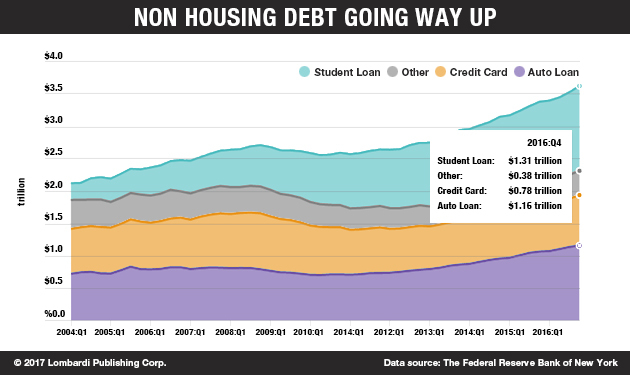 It’s no coincidence that the trend of credit card debt is to go higher. Have we reached a point of no return? We will only know when the next stock market crash occurs. We will not have to wait long for this to happen. We are heading toward the threshold and there appears to be no desire to make the radical changes to reverse this course. In such a situation, a substantial increase in rates from the Federal Reserve could lead to catastrophic results. Americans are already indebted to their teeth. Any rate hike could send the already battered American middle class to a point of no return. In addition, history has shown that sharp increases in debt are the warning signals of an imminent financial crash. A crash—as opposed to a market correction—inevitably leads to a recession or a depression. It has taken the developed countries almost nine years to restore GDP growth to pre-2008 crisis levels. Debt is not just a problem for individual U.S. wage earners. The U.S.’s net financial position towards the rest of the world remains passive. The U.S. owes more to the rest of the world than it owes the U.S. Therefore, take U.S. economic growth stats with much salt. The administration will try to promote it, but look beyond the headlines. You will realize there is much to fear.